Is Rainbow Really A Bow??? Everyone will agree that rainbow is one of nature's most splendid masterpieces. A simple phenomenon of bending of light as it passes through water droplets can create such amazing spectrum of colors: Rainbow! Light is refracted as it enters the raindrop, then reflected inside the drop and again refracted as it goes out of the drop. 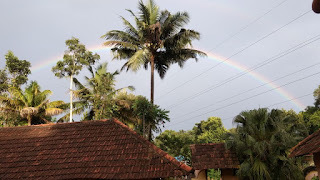 How can we view rainbow ?? To have a view, your back must be to the sun as you look at an approximately 40 degree angle above the ground into a region of the atmosphere with suspended droplets of water or even a light mist. Each individual droplet of water acts as a tiny prism that both disperses the light and reflects it back to your eye. As you sight into the sky, wavelengths of light associated with a specific color arrive at your eye from the collection of droplets. “Rainbow” comes from the Latin word “arcus pluvius” , meaning “rainy arch.” Ever wondered how rainbow got its name?? Rainbow got its name from its shape. A rainbow’s arc looks similar to a bow for shooting arrows. People also noticed that this colorful arc would only form when it was raining so they called it a rainbow. There is another interesting thing about rainbow is that no two people can see the same rainbow.. Its because a person standing next to you is standing in a slightly different spot and sees the rainbow in a slightly different place. The rainbow may look the same but there a little different because the person next to you sees different raindrops. It’s actually an optical illusion appearing because of the angle to the water droplets in relation to the light. Most people have never noticed that the sun is always behind you when you face a rainbow, and that the center of the circular arc of the rainbow is in the direction opposite to that of the sun. The rain, of course, is in the direction of the rainbow. The truth is, there is no set number of colors in a rainbow! Each hue blends into the next without a hard boundary, leaving the interpretation up to the person who sees it and the culture that has defined it. A rainbow is in fact a full circle of light. However, due to most people viewing a rainbow on the ground we only see a semi-circle or arc of the rainbow. The only way to see the full circle of a rainbow in the sky is to be above the raindrops and have the sun behind you. You would have to look down on the drops from an aeroplane. Does safe plastics mean safe for people, or safe for containers? The word "plastic" can mean a wide variety of substances and contain many chemicals, some of which have been identified as potentially harmful. Manufacturers often add different chemicals to plastics to give them the exact characteristics they’re looking for, like flexibility, strength, and reduced production cost. These chemicals include dioxins, cadmium, parabens, bisphenol A, phthalates, polychlorinated biphenyls (PCBs), agricultural chemicals, polybrominated flame retardants, and some of the active ingredients in sunscreens. These are called endocrine disruptors, substances which when taken into our bodies, alter normal hormonal function. Latest research has given us a lot of good reasons to think carefully about how we use plastics. Although some of these plastics are considered safe, there is still risk, no matter how small. You can identify the type of plastic in a container by looking at the recycling code number. These are made from polyethylene terephthalate, or PET. These are the soft plastic bottles most commonly used for bottled water. PET bottles contain no BPA or faux-estrogen, but do pose potential health risks. These bottles are often linked to bacterial contamination when they are re-used. This is primarily due to the bottle's design and cleaning detergents and high temperatures can cause chemicals to leach out of the plastic. PET plastic is recyclable and about 25% of PET bottles in the US today are recycled. The plastic is crushed and then shredded into small flakes which are then reprocessed to make new PET bottles, or spun into polyester fiber. This recycled fiber is used to make textiles such as fleece garments, carpets, stuffing for pillows and life jackets, and similar products. Products made of PET plastic should be recycled but not reused. It is a type of plastic that’s tougher and stronger and can endure higher temperatures than most other polymers. HDPE, which is considered a low-hazard plastic, is often used for milk, water and juice bottles, as well as bottles for cleaning supplies and shampoo. It's also used to make grocery bags and cereal box liners. HDPE plastic is very hard-wearing and does not break down under exposure to sunlight or extremes of heating or freezing. For this reason, HDPE is used to make picnic tables, plastic lumber, waste bins, park benches, bed liners for trucks and other products which require durability and weather-resistance. Products made of HDPE are reusable and recyclable. HDPE (like most plastics) has been found to release estrogenic chemicals. PVC plastic can be rigid or flexible, and is commonly found in bags for bedding, shrink wrap, deli and meat wrap, plastic toys, table cloths and blister packs used to store medications. PVC contains toxic chemicals including DEHP, a type of phthalate used as a plastics softener. Phthalates are one of the groups of "gender-bending" chemicals causing males of many species to become more female. These chemicals have disrupted the endocrine systems of wildlife, causing testicular cancer, genital deformations, low sperm counts and infertility in a number of species, including polar bears, deer, whales and otters, just to name a few. 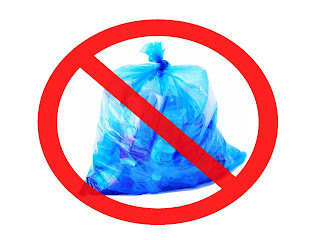 Products made using PVC plastic are not recyclable. While some PCV products can be repurposed, PVC products should not be reused for applications with food or for children’s use. DPE is used in bags for bread, newspapers, fresh produce, household garbage and frozen foods, as well as in paper milk cartons and hot and cold beverage cups. While LDPE does not contain BPA, it may pose risks of leaching estrogenic chemicals, similar to HDPE. LDPE is considered less toxic than other plastics, and relatively safe for use. Products made using LDPE plastic are reusable, but not always recyclable. PP plastic is used to make containers for yogurt, deli foods, medications and takeout meals. While polypropylene is said to have a high heat tolerance making it unlikely to leach chemicals, at least one study found that PP plastic ware used for laboratory studies did leach at least two chemicals. Polystyrene, also known as Styrofoam, is used to make cups, plates, bowls, take-out containers, meat trays and more. Polystyrene is known to leach styrene, which can damage your nervous system and is linked to cancer, into your food. Temperature has been found to play a role in how much styrene leaches from polystyrene containers, which means using them for hot foods and beverages (such as hot coffee in a polystyrene cup) may be worst of all. Because polystyrene is structurally weak and ultra-lightweight, it breaks up easily and is dispersed readily throughout the natural environment. Beaches all over the world have bits of polystyrene lapping at the shores, and an untold number of marine species have ingested this plastic with immeasurable consequences to their health. Polycarbonate (PC) plastics are a naturally transparent amorphous thermoplastic.Polycarbonate is an incredibly useful plastic for applications requiring transparency and high impact resistance. Number 7 plastics are used to make baby bottles, sippy cups, water cooler bottles and car parts. BPA is found in polycarbonate plastic food containers often marked on the bottom with the letters “PC” by the recycling label 7. Some polycarbonate water bottles are marketed as ‘non-leaching’ for minimizing plastic taste or odor, however there is still a possibility that trace amounts of BPA will migrate from these containers, particularly if used to heat liquids. Bisphenol A, or BPA, is one of the most commonly cited culprits, and is found in hard plastic bottles marked with plastic code "7. "The BPA used in Type 7 plastic water bottles is linked to a number of potential complications for pregnant women and the fetus. BPA acts as a faux-estrogen, and can cause chromosomal abnormalities of fetus. Water bottles containing BPA have also been linked to increased rates of disease in adults. humans with the highest concentrations of BPA in their urine are three times more likely to suffer from cardiovascular disease and 2.4 times more likely to have Type 2 diabetes than people with low BPA concentrations. It is better to avoid reusing containers that are used for take-aways and home delivery. According to studies, such plastic containers have a high affinity for fats and once they come in contact with food high in oil or fat-based substances, they can never be truly clean for a second use. The plastic is irrevocably altered even though it was originally marked as food grade. Also remember, that any containers, if they have been used to store non-food items like detergent or paint should never be used for storing food. Plastics with the recycling labels #1, #2 and #4 on the bottom are safer choices and do not contain BPA. A new generation of compostable plastics, made from bio-based polymers like corn starch, is being developed to replace polycarbonates. These are also included in category #7, which can be confusing to the consumer. These compostable plastics have the initials “PLA” on the bottom near the recycling symbol. Some may also say “Compostable.” PLA coded plastics should be thrown in the compost and not the recycle bin since PLA compostable plastics are not recyclable. Since it is impossible to totally eliminate plastic from our life, we can limit our exposure to the worse offenders. The most important thing we can do is take steps to help our body detoxify from any of the toxins we may ingest. This can best be done by boosting our intracellular glutathione.you can replace your favourite things with glass, stainless-steel, or ceramic dishes. Still, better safe than sorry.